William F. Ihrie Jr., 60, of 1157 Lynnhurst Circle, Bethlehem, died Friday, Sept. 25 (1998), in St. Luke's Hospital. He was in the insurance business for more than 30 years before retiring in 1994. He worked as a field representative for General Accident Group in Philadelphia and with Fireman's Fund Insurance Co. He more recently owned and operated the Ruthhard-Smith Corp. in Bethlehem, Henry McKeen & Son in Easton and Hoelzel insurance agenvies in Wind Gap and Pen Argyl. He was a C.P.C.U., the highest level of property and casualty insurance agents in the United States. Born May 11, 1938, in Easton, he was a son of Emma Ihrie of Bangor and the late William F. IhrieSr. He was a member of East Hills moravian Church in Bethlehem. He was a secretary and past master of Pen Argyl lodge 594 F&AM, and was active with Easton Hospital where he served as a bord of director member of the Valley Health Foundation. He was vice president and member of the board of Nazareth Mutical Insurance Co. in Nazareth, a past member of the Bethlehem lions Club and member of the Shriners Organization. 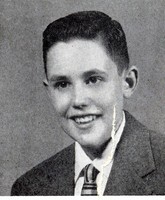 He graduated Moravian College in 1959. His wife, the former Elizabeth Gergar, died in June. Surviving in addition to his mother are a son, Mark of Bethlehem; and a sister, Betty Jo Crane of Bangor. Services will be held at 1 p.m. Monday in Cinnell Funeral Home, 245 E. Broad st. Bethlehem. Call 7 to 9:30 p.m. Sunday in the funeral home, with Masonic services at 8:30 p.m. Burial will be in Holy Saviour Cemetery in Bethlehem. The family requests memorials to Holy Family Manor, 1200 Spring St., Bethlehem, PA 18018, or to Caring & Sharing Endowment at Easton Hospital, 250 S. 21st St., Easton PA 18042.